There are a couple funny moments and overall, it has better pacing than the first but It's a near-exact copy of the original film and it becomes very predictable and somewhat dull. 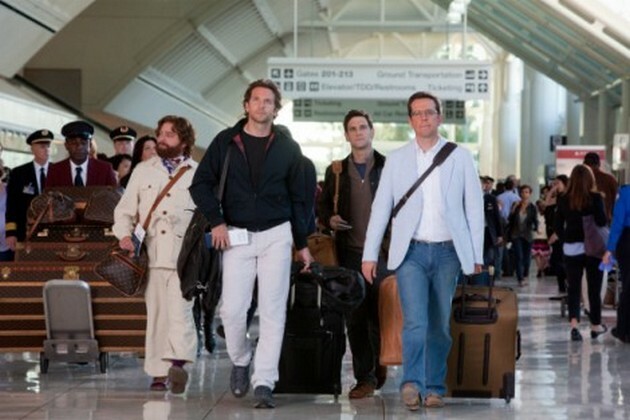 Merely two years ago, The Hangover was released to both critical and financial success. Now, as expected, we are faced with the sequel which puts most of the characters back into a very similar situation that they found themselves in in Las Vegas. Admittedly, I didn’t find the first film all that funny. It had its moments, but didn’t really deliver any of the big laughs that I’d heard reports of. Because of this, I was a bit hesitant for The Hangover Part II because sequels are usually not as good as the originals that spawned them, but this film was a special case. It turns out the filmmakers didn’t have to worry about it being better or worse because they basically just made the first film over again. It begins exactly as the original did with Phil (Bradley Cooper) putting in a call to Tracy (Sasha Baresse) to tell her that his latest trip with Alan (Zach Galifianakis) and Stu (Ed Helms) has gone terribly wrong. It then jumps back a week to show us how things got there. Stu has found the love of his life, Lauren (Jamie Chung), and is about to be married with the wedding to take place in Thailand. Phil, Alan, and Doug (Justin Bartha) all fly out to attend and, of course, they decide to have a drink together with Lauren’s brother, Teddy (Mason Lee), the night before the big day. The next morning finds Phil, Stu, and Alan waking up in a hotel room in Bangkok not remembering anything that they did the night before. Just like before, several strange things have happened: Teddy is missing having left behind a finger, Stu has a tattoo on his face, and Mr. Chow (Ken Jeong) has shown up. Following any small clues they can find, they try to piece together what happened the previous night in order to find Teddy and get back for the wedding. Now when I say they basically made the first film over again, I really mean that. Aside from a few minor plot details, this sequel follows the original pretty much beat for beat. We get the same opening scene, the same kind of set up, the following of the clues, a short list of wacky things that happened, a sudden realization of where the missing person is, a rush back to the wedding, and the pictures of what happened during that wild night. I guess the writers, Craig Mazin, Scot Armstrong, and Todd Phillips, didn’t want to take the risk of doing anything different in case what they came up with was disliked by the public, so they just ended up copying what Jon Lucas and Scott Moore had done before. However, as an interesting side note, after looking at the final draft screenplay of the original film, it turns out that Phillips and Jeremy Garelick did uncredited revisions on the script (uncredited because of some strange WGA rules), so in a sense, you could say that Phillips was recreating what he already did as his and Garelick’s changes to the original draft by Lucas and Moore were quite substantial. To be fair though, the writers of the sequel did come up with a few funny parts, which again makes it similar to the original in that there’s not a lot to laugh-out-loud at, but there are a few enjoyable spots. They try to squeeze a lot of the humor out of gross-out situations, which doesn’t really hold a lot of laughs, but does deliver a few surprises. The problem with it being so close to the original film is that it becomes very predictable very fast. Once you see that they’re not going to diverge from what had come before, you just get to sit back and wait for the sudden realization of the answer with everything subsequently falling into place. The situation may be a little different, but the development of the story will merely leave you nodding your head with each poke at the original film. Speaking of which, that’s something else the writers do a lot of throughout this film. As if this sequel isn’t a big enough reminder of the first film, they threw in numerous references to the original as if to ask us “Remember when this story was fresh-er?” However, there is something that the filmmakers managed to do better with this sequel than the original, and that’s that they managed to cut it down and make it feel a lot leaner. Rewatching the original the other day, I was reminded how stretched out and lengthy it had felt, whereas this film felt like it went by much faster by having a lot of the unnecessary parts cut out and getting into the main story much faster. Overall, your enjoyment of this film will correlate directly to your enjoyment of the previous film. If you liked it, you’ll like this one, if not, you won’t enjoy the sequel as it’s just more of the same. It’s just lazy and embarrassing that the filmmakers felt the need to Xerox the first film. There has already been talk from director/writer Todd Phillips about a possible third film acting as a conclusion to a trilogy, but not using the same template as before. It would have been great if they had chosen a new template for this film, but if the third film does end up happening and ends up utilizing a new idea, then perhaps it will end up being even better than the original and its clone.